An Arizona sheriff conceded that there has been “a lot of weird cow activity” in his county lately. A large black cow attacked a woman and a sheriff’s deputy Friday in the Antelope Valley area, according to the Navajo County Sheriff’s Office. The woman called for help, and when deputies arrived the cow had pinned the woman to the ground, the The Arizona Republic reported. When the woman tried to wiggle free, the cow pressed on her more aggressively, the newspaper reported. Deputy Vincent Palozzolo tried to scare the cow away, by yelling and waving, and then tried to push the animal off the woman, the Arizona Daily Sun reported. The sound of the deputy’s taser did not work either, the newspaper reported. 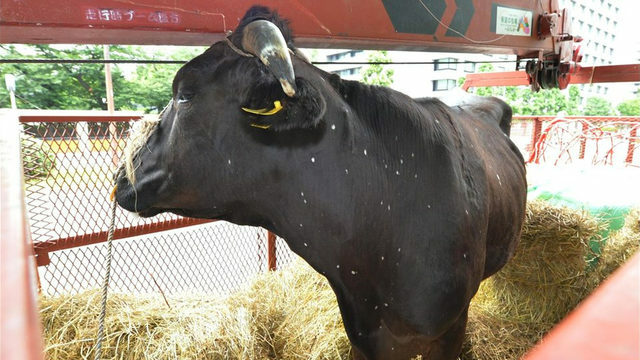 Finally, Palozzolo touched the cow with his stun gun and the animal left the woman alone, the Republic reported. But instead of running away, the cow attacked Palozzolo, according to the newspaper. Palozzolo was knocked to the ground and the cow stepped on his leg and chest, the Republic reported. Palozzolo repeated used his stun gun on the cow’s head until the animal ran away. Neither person was seriously hurt, although Palozzolo suffered an abrasion on his left arm and complained of soreness in his left arm and left leg, the newspaper reported. The Navajo County Sheriff’s Office is trying to find out who owns the cow. "Recently there has been a lot of weird cow activity in Navajo County," Sheriff Kelly Clark said in a news release.